No question, there was something special happening with the Dead and Roosevelt Stadium from 1972 to 1974. From all accounts, the ball field had nothing going for it. It was dirty, old, and unappealing. Yet, the venue brought forth some of the Dead’s most landmark performances, coupled with some of the finest outdoor audience tape documents of the era. It’s great when those things work together – music reaching transportational levels that melt your surroundings and leave you one with the music. One show of this small bunch that might get some of the least attention is 8/1/73. The big set two jam circulates in pristine SBD form, and has for many years. The rest of the show turned up around 2002 in subpar SBD, and around that same time, AUDs made it into wider circulation. Jeffrey Siniawsky contacted me one day out of the blue after finding my extensive notes that accompanied the Watkins tapes I put into circulation. He had his own recording, done on Uher reels, and wanted to get them to me in an effort to share them at large. Well, Watkins wasn’t the only date he captured from the Summer of ‘73. He taped 7/31 and 8/1 as well. Just as I set about seeding his 8/1/73, another AUD source came my way (I am a firm believer that these tapes find their way into circulation often due to nothing more than the attention being paid to them at particular times). This second AUD tape was a multi-gen source, but blew my head off. I immediately switched my efforts to the new tape, and used Jeff’s to fill in the gaps, which were large (Dark Star through Morning Dew). This tape reveals some of the most up front, clear, rich, and powerful sounding Dead music of the year. An outdoor AUD paradise. Not only is everything crisp, but there’s great low end too. It’s a real pleasure for the ears. A strong show from start to finish, it is well worth travelling the entire road on 8/1/73. That said, the obvious highlights are mighty indeed. There were 50 Bird Song’s from 1972 to 1973; the song making its return on 7/18/72 (also at Roosevelt Stadium). But of these, only 12 occurred in 1973 itself. It’s a real shame that this song fell out of the rotation because it consistently drew out inspired and richly psychedelic explorations. If ever there should be a Bird Song solo put to paper and held up as the one to study, this should be it. In a show that had no Playin’ to close the first set, this Bird Song tucked in the center delivers everything you could want in a jammed out first set closer. This particular version bleeds 1973. Jerry’s solo floats effortlessly. Toward the end, he plays a slow run of harmonics which tinkle like bells on the backs of butterflies, followed by a rapidly rolling lead line that takes the form of a thousand raindrops. The last verse comes back and Jerry’s voice overflows with gentle grace. Again, his solo leaps into the air and sings praises to the sky. For the Dark Star, we switch to Siniawsky’s reel. Mysteriously, it begins with a recording not his own. On his reel there is this dubbed-in stereo master for the first minute. He couldn’t recall any details around doing this editing, and thus was seeded a still unfulfilled quest for the complete stereo AUD master from 8/1/73 (and 7/31). All I did was a smooth crossfade between sources. Siniawsky’s AUD only pales slightly to the main source, and we are once again treated to a wonderful recording. Dark Star places us firmly back in the same luscious space where Bird Song left us. It grows and grows until the band picks up the pace and proceeds into one of the more stunning passages of the summer. Jerry and Keith deliver some of their finest work. When you hear people talk about the jazzy jamming of 1973, this is it. The space after the verse finds many interesting things going on. There’s the sound of trees creaking in the night breezes, or that of old boats rocking with the waves. From this Jerry plays a slide solo that sounds like an old Irish folk song of sadness and lamenting; like the story of some widowed bride who cries on a cliff top overlooking the sea that has stolen her love. There’s a moment where someone (Billy?) plays a thumb piano and later some chimes (not the norm at all – the chimes also appear on 7/31). Dark and quiet space ensues, and a tiger jam takes form, drawing the song to a close and slipping nicely into El Paso. I’m always a fan of the way these cowboy tunes could appear in the heart of a set two jam. The tunes typically have a bit more going on than if they showed up in the first set, and this El Paso is no exception. Jerry is on fire. This leads us to Eyes of the World, a monstrous 1973 version clocking in at over 20 minutes. It rolls and rolls. Finally, the jam leads us to the pristine shores of another 1973 Morning Dew. 72 shows in 1973, only 15 Morning Dews. The song is timeless, typically betraying nothing of the era from which it is being played. Again, Jerry’s voice is emotive and hypnotically draws you in to listen. He’s solos ring with the same emotion, and from the near whispers to the colossal peaks, this Morning Dew is full of drama and fire. The song hardly ever disappoints. This Bird Song perfectly encapsulates why I (once an elitist jazz purist) love the Dead. Thanks. Sven, thanks for posting, and for mentioning that your heart is being won, step by step, by AUDs. I love to know that my personal pleasure can be shared, and enjoyed, by others. It was one of the greatest parts of running the ADT (Audience Devotional Tree). Glad to see it still happening. Icepetal ,appreciate the attention you give both to aud's and some great music that needs to be heard. I love auds...there really is nothing like a good aud. particulary when it is the good ol' Grateful Dead. The Winterland 1973 Box Has Arrived! Should I buy it? what's your opinion of end-of-year 1973? Maybe wait for Winterland end-of-year 74 boxset? End of the year 1973 is fantastic. All those Playin' sandwiches are great. I definitely recommend the Winterland box. 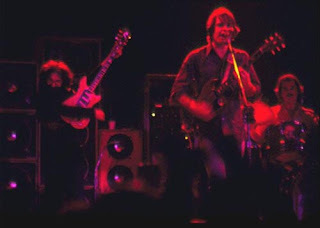 The Dark Star from 11/11/73 is one of the greatest ever! I jammed this show up to mid-Eyes at work, then had a bus ride hiatus. I just finished the final portion (Morning Dew on). Excellent stat on that song in 73 btw. I am surprised nothing was mentioned in the review about the GDTRFB. It is perhaps the best song of the show. Jerry's solo with about 4:30 remaining on that track is one of the best i've heard so far in my listening to the band. I also gotta say - This site delivers the depth that every new deadhead craves. Thank you cyberdeadgurus. Something special always happened at Roosevelt Stadium. Music, weather, sound -- incredible nights. Many tales from the road: dosing for a "rain or shine" event that was subsequently cancelled -- driving home on acid and spending a quiet night on the couch . . . Hell's Angels, vans and not a veggie burrito to be seen! Dona’s hair blowing in the scarlet lights, the flame eating / flame throwing guy. I remember when they kicked up the Wall of Sound -- lows rumbling right up your spine and tinkling highs somehow dancing around your ankles and the concrete. Funny -- I just drove past the site the other day. I will always have fond memories. Thank you so much for this wonderful blog! I pick up your posts on the facebook feed and enjoy listening to the shows and reading the accompanying blog entries. This is an essential resource for newbies like me, who due to late birth and/or musical ignorance never got to see Jerry and the Dead in concert. Also, like others said, my appreciation for audience tapes has increased greatly. :) Thanks again and I am looking forward to many more posts. The Grateful Dead Listening Guide opened me up to the amazing world of audience recordings back in 2008. Previously, I had collected all of the official releases and a number of soundboard recordings on the Archive, but I never knew where to start with audience tapes. 8/1/73 was one of the first AUDs I heard, at the behest of this blog. I am ever so grateful for icepetal's guiding influence, and for the tapers who captured these magical shows. The "Bird Song" is absolutely breathtaking. I too am looking forward to many more posts. The first time we ever heard of steve silberman he was on gans show one weekend about 20 years ago gushing about this show. Made it a priorty trade and still got the cassate in the wagon. There's also a quality, circulating recording of The Band's set from this show, if anybody here wants to recreate the entire concert at home. Wonderful blog you have here. Your taste and evocative writing are both mighty impressive. Thanks so much for your guidance. Curious to know your take on the quality of the recently surfaced 24 bit Monte Barry recording of this show?? I think the Monte Barry AUD is great - fantastic documentation all around. Somehow I'm still a bit more drawn to the crisp upfront quality of this one though. Might just be me. I haven't done a direct side by side though, which tells me it is ALL good. :-) What do you think?